On Saturday, 30 October, I flew my second stage check--a test with one of the senior flight instructors at the school. The stage checks are intended to simulate checkrides, and a successful sign-off is required before I can make my long solo cross-country flight. This was, by far, the most exasperating flight so far. The short version: I passed and will be making my long solo XC flight soon. I had planned a flight from Manassas to Louisa (KLKU) and I got to the airport early to finish it based on the current winds aloft, density altitudes, computed fuel burn, etc. The oral portion of the test was no problem, though I was again warned not to volunteer more information than was asked so as not to dig a hole for myself during the FAA practical exam. Good advice. The instructor scrutinized my flight plan. He told me that I needed to put airport information, including a runway diagram in the remarks section of the flight plan form--another good thing to do. I entered the course heading in the first departure block rather than the "top of climb" entry. I realized that mistake ahead of time but forgot to strike it out. I also mistakenly added the taxi and run-up fuel burn in with the pattern/climb burn. OK, no problem. We were running behind schedule and the airplane was scheduled right after my flight. After a complete--but motivated--preflight I took off on runway 16R. A Cherokee was on base for landing, but the tower cleared me for takeoff. Though I expedited my takeoff, the Cherokee must have been flying a really tight pattern and I think I heard the tower order them to make a 360 degree turn to make sure I was clear. I started the course intercept procedure by declaring that I was going to make a 45 degree turn at the usual 900 feet (the traffic pattern altitude - 300 feet). First mistake. That turn needed to be at 1200 feet since we were leaving the pattern. 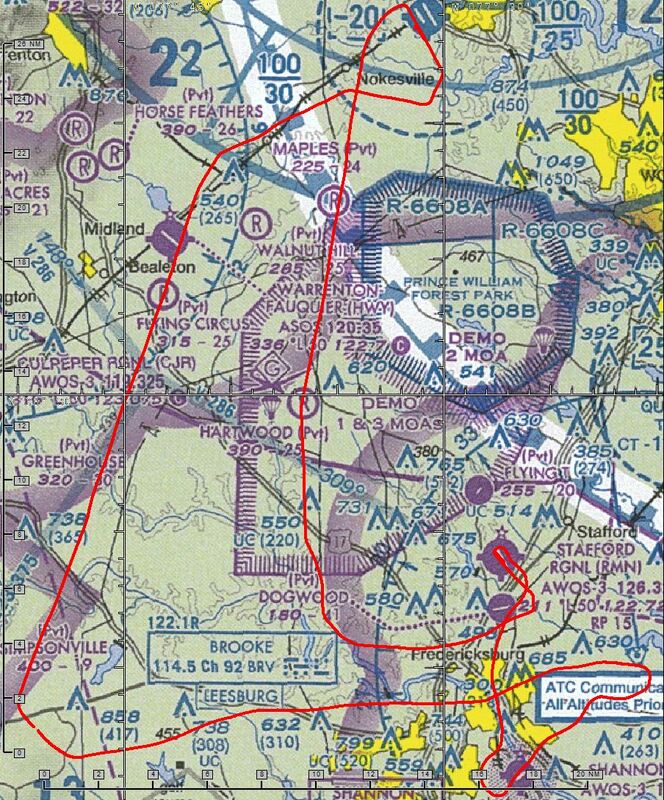 Once at 1700 feet (TPA + 500 feet), I turned 30 degrees past my intended heading to intercept the course. The CFI told me ahead of time that he would be watching how well I intercepted the course, so I focused on precisely flying to the imaginary course line. In so doing, I climbed 100 feet above the 2300 feet filed in my SFRA flight plan and continued to climb. The Dulles class B airspace looms overhead and promises a violation if busted, so I was duly chastised. I am usually hyper-conscious of the DC airspace, but this CFI was very successful in distracting me and actively adding stress. Errors began to snowball. That fiasco caused me to forget to cross-check my directional gyro with the compass, though I had done it once during the run-up. The directional gyro in this particular airplane precesses terribly and one needs to check it at least every 5 minutes to remotely stay on course. So I was heading off course and I realized it when we crossed the railroad tracks, but that occurred right when Potomac Approach called to terminate my RADAR service. I postponed dealing with my course situation for a second to ask Potomac for flight following to Louisa--usual procedure for a cross-country flight-- though I usually ask on first contact with them after takeoff. So I fixed my course situation with Warrenton (my first checkpoint) in sight. We passed the tower at Catlett and I indicated my intent to climb to our planned altitude of 3000 feet, so as to reach the top-of-climb point before the first checkpoint. Now, I usually just wait to climb until around Warrenton since it is unmistakenly outside the Dulles Class B airspace, but I was trying to stick to the plan. My climb profile of 500 ft/min would have put me near the 3000 foot floor of Dulles airspace before we left it. It was reminded that I had my priorities out of whack (aviate, navigate, communicate), and that I was completely behind the airplane. OK, he's right, and the reason is that I altered my routine to try to pass this test. I followed the course and made my second checkpoint at the planned time. I saw a biplane in the distance doing aerobatics. I began calling out points on the chart that I was looking for to confirm that I was on course. One was Simpsonville, which I couldn't find. I said that I think it is a grass strip, to which I am told that it is a terrible checkpoint. "Not a checkpoint, just pilotage," I say. I am then instructed to don the hood and fly to the Brooke VOR. No problem. I start turning to about 090. When he asks me what I'm doing, I say this is the rough heading to get there--I learned later that this was one of the few things that I did correctly. I declare my intention to identify the VOR (listen to the morse code it broadcasts to ensure the VOR is operating and that we're receiving the correct station). Here again, I'm told my priorities are out of whack: since I have a centered CDI needle, start flying to it and then identify it. Good advice. I twist the OBS to center the needle and he asks what radial we're on. I say "one-zero-zero To" and add 180 to get the radial. My judgement is again brought into question, since the OBS is set to 097, and I had rounded. Don't do that. We make it to Brooke and I'm instructed to fly to Shannon, which is roughly 6 nm on the 240 radial. I begin to fly it once the barber pole was displayed in the CDI (cone of confusion over the VOR) and verbally said the time. I had my hands full and didn't write it down. I asked if DME (distance measuring equipment) was off-limits and tuned up Brooke. Once I thought I was 3 minutes on the course, I declared that we should be over the airport. Nope. We had a few minutes still to go, and my lack of common sense was pointed out because I could have just looked at the DME distance indication. All good stuff to remember for next time. I was then told to fly to Stafford (KRMN). I looked on the chart and computed a rough course of about 010. We approached runway 33 when he pulled the throttle to simulate an engine out. I pitched up to best glide airspeed and adjusted trim. I wasn't sure we could fly the entire pattern to the downwind runway (15). I had never been to this airport before. In a real engine out situation, I probably would have gone to full flaps and forward slip for runway 33 and just landed with a tailwind. I said I wasn't sure we'd make it by flying the pattern for runway 15 (and not without the proscribed steeper-than-standard-rate turns). At that point we were flying faster than best glide airspeed, I was instructed to check my airspeed. He then took the flight controls, flew downwind, and made a 30 degree base-final combo and gave the controls back to me before touchdown. Again my judgement was in question. I also failed to dial up the AWOS and switch to the CTAF, as there was time to do so. Then I am to take us home. I plot a long course that avoids both the MOA and the restricted area. This is wrong. I follow a VOR radial instead and we turn to fly through the MOA. Manassas tower gave us a base entry to land on runway 16R. I pull power to 1500 RPM and add 10 degrees of flaps at a point where I usually do, but we are a little low, and that move is questioned so I add more power. I'm getting badgered all the way to the ground while trying to get my crosswind side-slip sorted out and hold about 70 KIAS for the gusts. We get a little slow--I was probably about 60 KIAS over the numbers and I started the flare too soon. Stall warning starts. CFI adds power and we land long. There were a lot of lessons to take away from this flight. The first is to act like pilot-in-command, even if that means telling the CFI that you are not going to do what they're asking. In the future, I will not deviate from my normal operating procedures for a test. While it wasn't pleasant, I am grateful for the experience. I am committed to becoming a safe pilot, one that will be able to handle any problems that arise. I passed this stage check, whatever that means, despite doing a terrible job of demonstrating that I am really not a fu**ing idiot.